Sony is allegedly working on multiple mid-range phones and one of those phones is the Sony Xperia XA3. It has been a while since Sony managed to surprise us with its phones and we are not expecting any surprise this time as well. 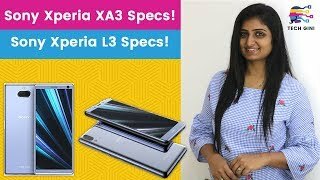 To find out what to expect in this upcoming phone and the Sony Xperia XA3 Dubai price, continue reading. Most of the phones from Sony looks quite similar and it has been that way for a long time. However, this one looks quite appealing with an impressive 84.5% screen-to-body ratio and is quite different from the mid-range phones we have seen from Sony so far. It’s definitely a big change compared to the Sony Xperia XA2. This phone comes with a near bezel-less and no notch 5.9-inch screen showing 2160 x 1080 pixels resolution, 18:9 aspect ratio and 409ppi of pixel density. For those of you who are into notches, there is the latest Apple iPhone XS and Google Pixel 3 XL you can check out. The display will be protected by Corning Gorilla Glass 4 but we don’t know whether it will be rated for dust or water resistance or not. Right after the Sony Xperia XA3 release date UAE, this phone can be found in four different colors: black, pink, silver and blue. Unlike its predecessor, the Sony Xperia XA3 comes with a dual camera setup on the back: one 23-megapixel camera with f/2.0 aperture and 24mm wide angle lens. 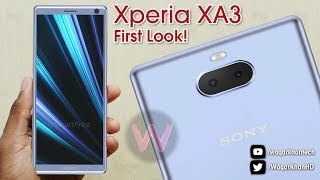 However, we don’t know much about its secondary camera yet and will have to wait for the Sony Xperia XA3 release date UAE to find out more. 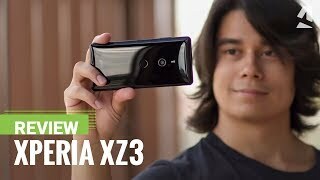 The rear camera will be capable of capturing 2160p videos at 30fps. As for the front camera, it’s an 8-megapixel camera with f/2.4 aperture. For those of you who are in the market for a phone with good camera, there is the OnePlus 6 and Google Pixel 2 you can check out. These are almost in the same price range as the Sony Xperia XA3 Dubai price. One of the major complains about most of the phones from Sony is it’s poor battery life. We won’t be able to verify how much of that problem has been solved in this new phone before the Sony Xperia XA3 release date UAE. However, what we do know is that this phone will be packing a decent 3600mAh battery with Quick Charge 3.0 support. As this phone is packing a Qualcomm Snapdragon 660 octa-core processor with 4GB of RAM, this battery should easily last a day if not more. We will have to wait for the official release to put this theory to test. Some of the other notable features are: 3.5mm headphone jack, Android 9.0 Pie right out of the box, Bluetooth 5.0, GPS, NFC, USB 2.0 port, Type-C 1.0 reversible connector and fingerprint sensor on the side of the phone. The Sony Xperia XA3 is rumored to cost around AED 1500 when it’s here. Nothing has been officially confirmed by Sony yet so we will have to wait for an official announcement to confirm these leaks and rumors.